The W-DMX™ BlackBox series is an industry leader for Wireless DMX and RDM control, packed into a tough, roadworthy die-cast metal casing. As with all our top W-DMX™ technologies, the W-DMX™ BlackBox series is built for the true lighting professional. 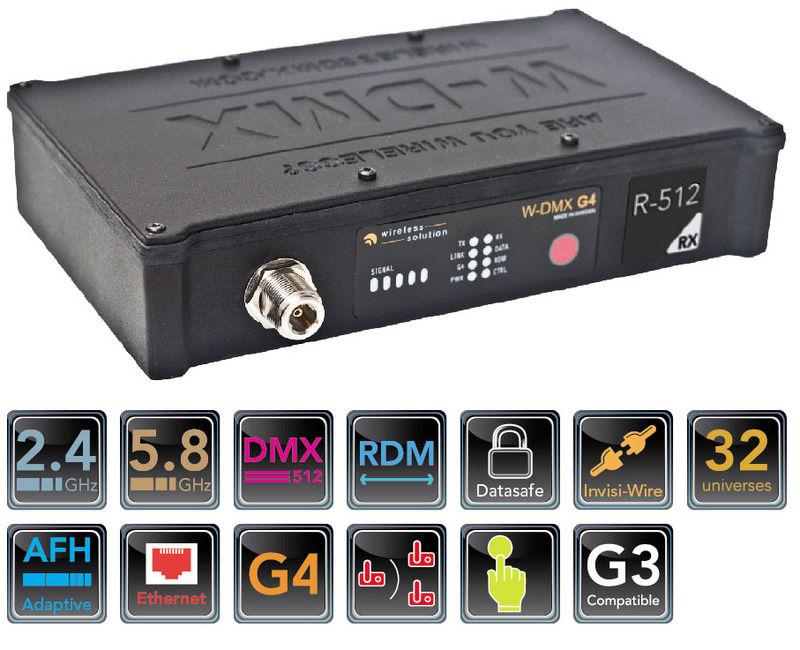 The W-DMX™ BlackBox G4 uses our patented Adaptive Frequency Hopping technology that automatically avoids interference created by other wireless networks, for example W-LAN, wireless intercoms, stage automation systems and more. BlackBox also include our advanced method of error correction called Data-Safe that correct any corrupt data before it gets to your lighting equipment. Supporting both the 2.4GHz and 5.8GHz frequency bands, these dual band units have full RDM support, meaning even the most complex installations and the BlackBox units themselves can be configured wirelessly. 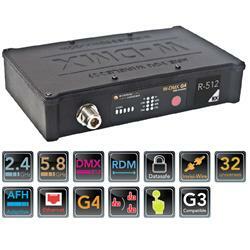 All BlackBox units are backward compatible with W-DMX™G3 units, protecting your investment in the W-DMX™range. A slot for the optional Ethernet PCB allows W-DMX™ BlackBox units to be enabled with Streaming ACN, Art-Net and other Ethernet based lighting protocol support, thus simplifying integration of the W-DMX™ BlackBox into larger, more complex installations. Built in automatically switching power supplies mean that no matter where you are in the world, BlackBox units are ready to go. And W-DMX™ units can be supplied directly by a battery thanks to the Phoenix Gold 12V input, and over a network through PoE (Power over Ethernet) with the optional network card. BlackBox units ship standard with a 2/4dBi dual band antenna, which provides up to an exceptional 800m of range. For links over greater distances, or for more complex projects needing one of Wireless Solution’s other antenna, the N-type antenna connector allows any compatible antenna to be easily attached.